John Glenn, a former NASA astronaut who became the first American to orbit the Earth in 1962, died Thursday at the age of 95, and almost immediately, people started sharing their memories and thoughts about the American hero. One of those people was Katherine Johnson, the "human computer" who helped check and invent the math that sent Glenn into orbit and brought him back home during his first flight decades ago. "A good man has left Earth for the last time. John Glenn's life will long be remembered for his time in space, his courage and his service to all Americans," Johnson said in a statement Friday. (Original Caption) 1962-Astronaut John H. Glenn undergoes last minute mediacl checks befoe the MA-6 launch. (Original Caption) Ca. 1961-Cape Canaveral, Florida-Astronaut John H. Glenn, Jr., is checked out in his pressure suit before entering the procedures trainer at the Manned Spacecraft Center at the Langley Air Force Base, Virginia. Glenn, a Marine Lieutenant Colonel, was selected as the primary mission pilot for America's manned orbital flight scheduled for late 1961 or early 1962. CAPE CANAVERAL, FL - February 20, 1962 - Astronaut John Glenn, Jr. photographed in space by an automatic sequence motion picture camera. Glenn was in a state of weightlessness traveling at 17,500 mph as this picture was taken. CAPE CANAVERAL, FL - At NASA's hangar S, Astronaut John Glenn, Jr. is being suited in preparation for his earth orbital flight aboard Mercury Atlas 6. Feb.20, 1962. (Original Caption) 3/9/1962-Washington, D.C.- Lt. Col. John Glenn flashes his now famous smile after he was presented two military insignia here today, for his spacetrip around the earth. Glenn received the Navy's 'astronaut's wings' (on his left breast pocket flap) and the Marine Corps' 'astronaut's insignia' (on his right chest). U.S. Sen. John H. Glenn Jr. (D.-Ohio), is assisted by suit experts Jean Alexander and Carlous Gillis prior to a training session at the Johnson Space Center (JSC). The STS-95 crew members are getting prepared for a scheduled Oct. 29 launch aboard the Space Shuttle Discovery. 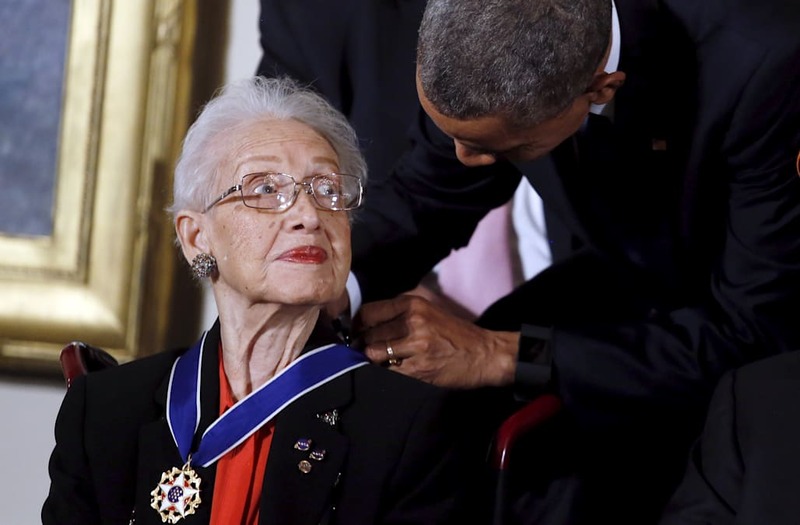 Johnson's life is the subject of the new movie Hidden Figures, which chronicles her work at NASA as well as the work of Dorothy Vaughan and Mary Jackson — two other African-American "human computers" who left a mark on the space agency but have not been widely celebrated until now. NASA credits Johnson (played by Taraji P. Henson) with "verifying the calculations made by early electronic computers of John Glenn's 1962 launch to orbit and the 1969 Apollo 11 trajectory to the moon." Glen Powell, the actor who plays Glenn in Hidden Figures, also paid tribute to Glenn's life on Twitter. Now THAT is how you live a life! Godspeed, John Glenn. A true gentleman who humbly touched the stars and made us believe in the impossible. In Hidden Figures, Johnson — who faces horrible discrimination due to her status as an African-American woman working in a white male space in the 1960s — is key to NASA Langley's goal of putting Glenn into orbit after the Soviet Union sent Yuri Gagarin up months before. Hidden Figures will be released in theaters across the U.S. on Jan. 6, with limited release starting Christmas Day.